Some fabulous under $30 finds at Sephora to put on your Christmas shopping list! First Aid Beauty FAB Delights ( $18; sephora.com) is a cute little mini First Aid Beauty set that comes with a mini tub of the First Aid Beauty Ultra Repair Cream in Vanilla Citron and an Ultra Repair Lip Therapy in Rosy Red. 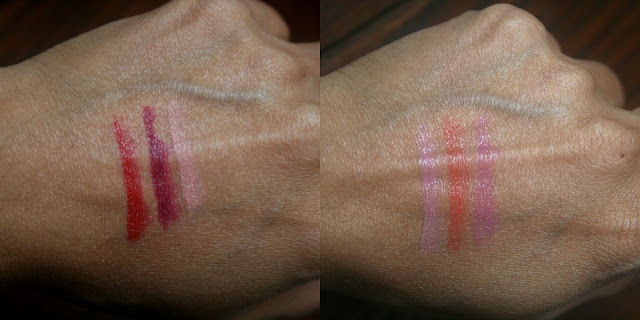 The FAB Ultra Repair Cream is one of my favorites, I quite like the Vanilla Citron while the Lip Therapy in Rose Red is just a gorgeous wash of plum! Sol de Janeiro Brazilian Beauty On The Go ($25; sephora.com) is a mini kit with two of Sol de Janeiro’s products - the bestselling Bum Bum Cream and the Brazilian Kiss Lip Butter. The Bum Bum Cream is a really lovely, gorgeous smelling body cream. I like it as a body butter and even as a hand cream. The Lip Butter is okay, its not too moisturizing, neither too drying. Sephora Favorites Glow For It ($30; sephora.com) has been one of the best selling, best valued kits this time around. I love, love this one and the selection in here. If you like your highlighters and want a nice variety, do try this kit out! The highlighters are all fantastic sizes, the Lancome Glow Subtil especially, since its a full size and more than makes up for the value of the kit. It has been sold out for weeks now, but worth keeping an eye on! Sephora Collection The Mini Team Rouge Cream and Rouge Shine Lipstick Set ($22; sephora.com) is another mini kit I love. The Rouge Shines are sheer and glossy while the Rouge Creams are creamy and more pigmented. Sephora Collection Cat Nap Sleep Mask ($14; sephora.com) is a cute little mask that blocks out most of the light while you nap! Milk Makeup Limited Edition Triple Threat Glow Set ($30; sephora.com) is a great way to try out a few of the brand’s products. The box it comes in is really nice to repurpose as an everyday lipstick tray or just to store basics like q-tips, etc. I loved the highlighter in the kit. Its a very flattering golden beige for my skintone. I have yet to try out the Face Mist and the Sunshine Oil & will update with a review on those soon! Mistletoe ($26; sephora.com) is a special edition lipstick for the holidays from Bite Beauty’s Amuse Bouche line. Its a beautiful festive red and the formula is a satin creme that is fantastic. Sephora Collection Mini Sponges ($10- $20; sephora.com) .These are pretty neat to have handy for touchups.They are quite small though, so not the most quickest for the whole face, but good for things like under eye concealer etc. The Solid Brush Cleanser that comes along is one of my favorite ways to clean my makeup brushes and sponges and has been for a couple of years now. These are a really nice value! Sephora Collection The Delicate Eyeshadow Palette ($10; sephora.com) is an eyeshadow palette that just launched as a Black Friday exclusive. The color selection is great if you are a neutral lover and the quality is amazing too. Its a steal for the price! Sephora Collection Objects Of My Perfection Bag ($20; sephora.com)is a new makeup bag that looks small, but is quite roomy and fits a ton of stuff. I can never have enough makeup bags. The design is minimalistic and easy to repurpose as a clutch. Wow I love the items and the lipsticks!